CK Vineeth and Anirudh Thapa scored for Chennaiyin FC in their 2-0 win over ATK in the semifinal of the Hero Super Cup. Get highlights and match analysis of the Chennaiyin FC vs ATK (CFC v ATK) Hero Super Cup semifinal match below. Get highlights and match analysis of the Chennaiyin FC vs ATK (CFC v ATK) Hero Super Cup semifinal match below. Chennaiyin FC beat ATK in the semifinal of the Hero Super Cup thanks to two goals in the second half of the match. CK Vineeth and in form Anirudh Thapa scored for Chennaiyin to seal their place in the final against FC Goa. Earlier, at the end of what can only be described as drab, lifeless 45 minutes of football, Chennaiyin FC and ATK were tied 0-0 at half time. Chennaiyin had all the possession in Bhubaneswar: five corners, 63% of the possession but no shots on target. ATK, meanwhile, had the solitary attempt on target in the first half. 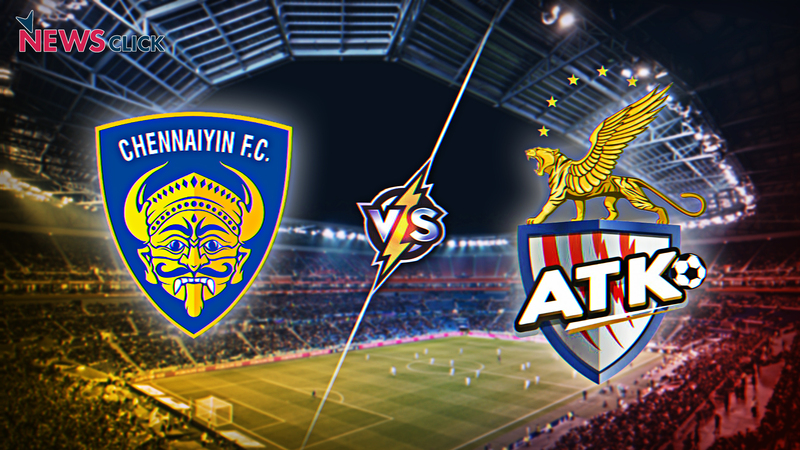 Get highlights and analysis of the Chennaiyin FC vs ATK (CFC v ATK) Hero Super Cup semifinal match below. Good Evening, and welcome to our live blog. As you while away time before this second semi final, between Chennaiyin and ATK, you might find our latest 420 grams offering interesting. Have a go. If you haven’t seen it already, then you may want to go see Vineeth’s opener for Chennaiyin in their opener against Mumbai City FC. Just. Go. Watch. It. Chennai have kicked us off. 1’ For context, both these teams have actually had a rather disappointing season. This is a season saving game. Chennai have already started on the front foot. Although Coppell sides are notorious for starting deep and capitalising later. 3’ Ladies and Gents, we have our first, erm foul of the day. Dhanapal Ganesh was caught late by Lallawmawma. Chennai are doing all the passing these last three minutes. ATK have touched the ball as a team perhaps thrice. 5’ As that was being typed though ATK took the ball and Balwant Singh and Lanzarotte combined beautifully to bring out the first half chance of the game. The ball fell to Lanza outside the box and he shot wide. But that was some nice build up play. 7’ Chennaiyin come close!!! A brilliant cross from the left and CK Vineeth shrugs off Bikey to get his foot on the ball. He is two yards from goal, but drags it wide. Debjit may have had it covered if it was on target. Maybe. Maybe not. 9’ Eugenson Lyngdoh takes a punt from 20 yards out and a acute angle. The ball bounces past Chennaiyin’s far post. It wasn’t as far as it looked at first though. 11’ Lots of ex-Bengaluru boys in the mix today by the way. John Johnson, CK Vineeth, Eugenson…. 12’ Something has happened here. In the moments that we were digging into a kebab, things have heated up on pitch. Lanzarote was brought down in the middle of the pitch by Herd, and then they were having a go at each other. The referee calms everyone down without any cards. 13’ Set pieces will be crucial here say the analysts on air. Both teams have used them in the buckets this season. 15’ First corner of the game now for Chennaiyin. And they almost have the opener. The ball travels across the box, the full length of the box without anyone getting a touch on it. And all it needed was a touch. It was Superbly delivered. 16’ Steve Coppell will be bothered by that careless defending. And another cross from the left causes havoc in the ATK box. Debjit punches it away, but he absolutely clatters Thapa while doing so. The kid is down. Steve Coppell by the way was also in the dugout on that fateful day West Brom played Chelsea in 2008. Stephen Hunt clattered into Cech causing a head injury that has meant the Arsenal goalkeeper wears his iconic headgear whenever on field now. There was immense praise from all quarters for Steve Coppell in how he handled the situation and also in his counselling of Hunt later. Cannot wait for half time. Or really understand why anyone bothers watching any of these clubs. Except for John Johnson. Bengaluru FC, in my opinion, could have moved a little faster and signed him on at the same time last season. In Bhubaneshwar even. What’s done is done, though. In conversations with players and coaches who have worked under Coppell in the ISL too, there is great regard for him. Unanimously they all call him a great man, who builds good relationships with players, and has a very humble approach in his interactions with the team. 20’ The broadcasters bring about the point that footballers need to play football rather than spend time in the gym. Fair point, and one that has been echoed regularly by Renedy Singh. 22’ On the topic of Renedy Singh, his new team NEROCA FC beat his old team Sagolband United in the CC Meet final today. Alas, Renedy wasn’t allowed to be in the dugout for NEROCA, seeing as Sagolband had registered him as coach for the tournament. Nice to see though that a side he influenced got that far and went up against the big boys of Manipur. NEROCA prevailed though. 24’ back to the game, and erm, not much to report in terms of action. Lots of pingng from Chennai, but they are losing the ball in bad areas, and ATK have been inefficient on the counter. Almost all of Chennai’s play though coming from the left. 27’ Mailson Alves makes a crucial crucial interception off an ATK counter. Edu Garcia almost caught Eugenson’s run, but Alves’ sliding block stopped a sureshot opening for ATK.